Christmas is right around the corner, meaning that there are a lot of special events happening not just for car washing businesses – but businesses in every corner of every industry. And while we won’t have Santa’s lap for you to sit on or Christmas lights adorning our washing stations (danger hazard!) – We do have lovely staff that are almost as good as Santa’s little helpers! We’re giving some limited specials that will have your car looking brand new. Roll into all your family Christmas parties with the shiniest, freshest smelling car! We have Christmas specials on a range of deals in hand car washes, car detailing and clay-bar polishing services. Merry Christmas to your car! What Specials Are On Offer? 20% Discount on Hand Polish: Includes inside and outside car wash, tar removal, including hand wax and polish on the cars exterior. 20% Off Clay bar Services: This also includes inside & outside car wash, tar removal, hand wax and polishing, as well as the addition of a Clay Bar Paint Cleansing treatment. Clay bar treatments help to remove any harmful residue and contaminants that may be left on the surface of your car after a car wash. This include fibreglass and metal – that can cause damage to your car’s surface. 10% Off Car Detailing: a full interior steam clean (including the boot), leather cleaning and conditioning, engine bay clean, cut and polish. Our technicians are also qualified car spray painters that can remove the micro-scratches and surface damages that have accumulated over time. Whether you’re after a car wash and detailing in South Melbourne to get your car looking brand new or sales ready, we can help you out! 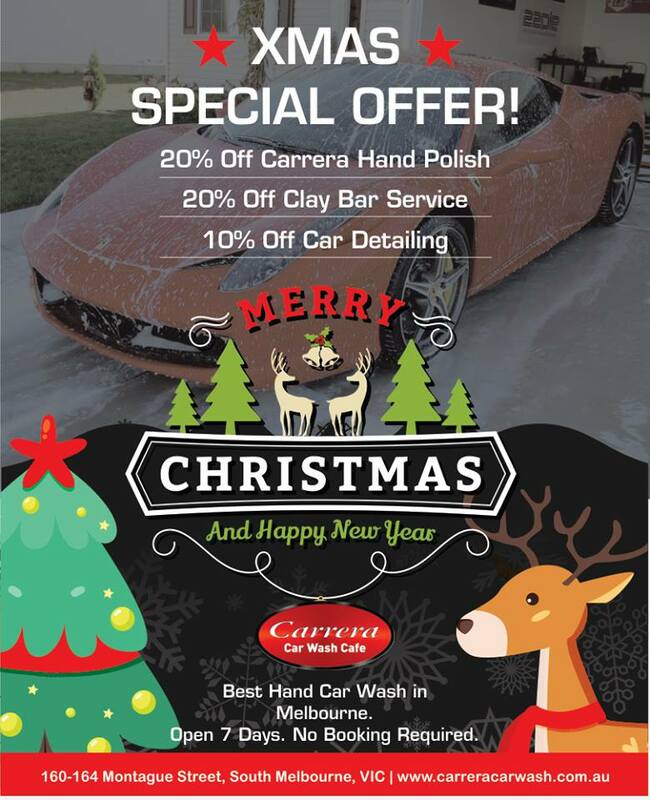 For services in Port Melbourne and South Melbourne – visit Carrera Car Wash Cafe!